The “INTRODUCTION” to today’s lesson reads, “Isaiah 25, identified as a praise psalm, provides not only assurance but a reason for rejoicing now, even in a world where many have experienced and are experiencing oppression due to the ravages of war and the evil of men. There is the promise of deliverance for God’s people and, most importantly, the promise of elimination of the final oppressive enemy—death”. Some modern day forms of ‘Social’ OPPRESSION are: Sexism, Classism, Racism, Ableism, Lookism, Size-ism, Ageism, Colonialism and Nativism. Have you seen or felt any of these in your life? African Americans are very familiar with the form of OPPRESSION known as RACISM, for you see, we have endured it, in one form or another, for as long as this country has been in existence. Death and the fear of death are also forms of oppression, for based on the definition of the word OPPRESSION, it is burdensome, cruel, and seemingly, unjust. It gives us a “feeling of being heavily burdened, mentally and/or physically”. It causes “anxiety and it is the ultimate of adverse conditions”. Death and the fear of death, are the primary motivating factors in all that we say or do. I’ll even take a chance here by stating part of one of my theories which is that, fear of death is what motivates man to create and take safe harbor in the various religions of the world. I’ll save the rest of that discussion for another time. That old OPPRESSIVE spirit of death will be no more! That’s God’s Promise in our lesson today. How will He accomplish this, you may ask? Jesus is the HOW! In a recent post on my cousin’s blog, seekthebestblog.com, called, ‘THE OLD DEACON’S PRAYER’, I mention a phrase, often used by Deacons of old, which says; “Father we thank you that the bed that we laid down on last night, was not our COOLING BOARD and that the SHEETS that we covered ourselves with, was NOT our WINDING SHEETS”. The “COOLING BOARD”, in olden days, “…was a perforated wooden platform on which a dead body would be temporarily stored and prepared for a funeral. Ice was placed beneath it to keep the body chilled, slowing the decomposition process. Holes in the cooling board, which could be made of cane latticework rather than a solid wooden plank, allowed blood and other fluids to drain from the body (Wikipedia). The “winding sheets” spoken of by the old Deacons was, according to the Oxford dictionary; “A sheet in which a corpse is wrapped for burial; a SHROUD”. So if your bed was a “cooling board” and your bed sheet was a “SHROUD”, YOU HAD OBVIOUSLY SUCCUMBED TO DEATH! That’s what those old Deacons were referring to when praying that old prayer. But God promised to wipe DEATH from the face of the earth, for He said in verse seven, that He would destroy the SHROUD and the VEIL or SHEET. The VEIL is mentioned in Matthew 27 and Mark 15 which say, “When Jesus had cried out again in a loud voice, He yielded up His spirit. At that moment the VEIL of the temple was torn in two from top to bottom. The earth quaked and the rocks were split. The tombs broke open, and the bodies of many saints who had fallen asleep were raised.…” JESUS CONQUERED DEATH with His death and resurrection! The 1st century historian, Josephus, described the VEIL of the Temple as being 4 inches thick. It was intended to separate the common people from the “Holy of Holies”, which is where the Spirit of God dwelled during Moses’ time. The veil was also purported to be over 10 feet high yet, at the time of Jesus’ death, it was RENT/TORN from the TOP to the bottom—not bottom to top. If it were not the Spirit of God that tore that VEIL from the TOP—too high for a man to reach—to the bottom, then what or who was it? The tearing of the VEIL has a great deal of significance for us, for you see, it REMOVED the divide between us and God, no longer would we need priests to intercede for us when communicating with God. We could go to God ourselves, in the name of JESUS! What about the SHROUD! There is a SHROUD which is kept in the royal chapel of the Cathedral of Saint John the Baptist in Turin, northern Italy. This ‘SHROUD of TURIN’ is purported to be the “WINDING SHEET” of our Lord and Savior, Jesus Christ. 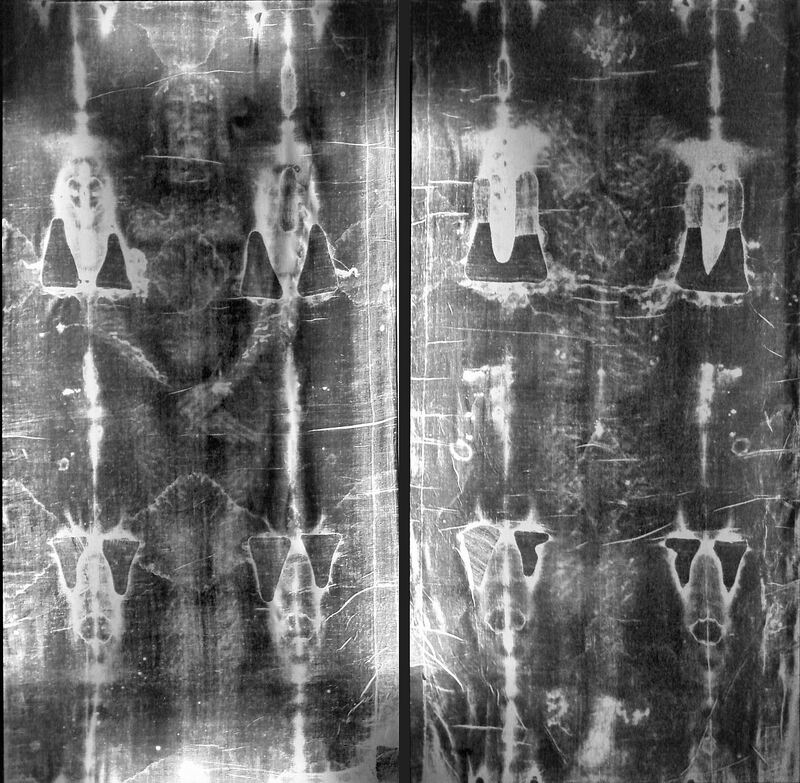 Many tests have been performed on this SHROUD in order to attempt to authenticate it, however, no consensus as to its authenticity has been able to be reached. I say this though; whether it is authentic or not authentic, is not as important as the fact that when it was found it was EMPTY! Whoever had been wrapped in it at the time of their entombment, was no longer there, and if it WAS Jesus…well we know the rest of THAT story! With Jesus’ death, burial and resurrection, DEATH HAD BEEN CONQUERED! GOD DID THAT JUST AS HE PROMISED IN ISAIAH! Just beautiful and poetic Ron. I’ve just done one of my why-do-I-do-this stints on a UK ‘religion’ forum, once more trying to explain my beliefs to a group that gives atheism a bad name; didn’t want to hear, just carp on. (though one guy give him his duty was more concerned about some people being made saints when others seemed more deserving- fair enough). Keep on with these posts Ron they are jewels in a world of too much fashionable trying-to-be-smart cynicism. Thanks Roger. I’m glad I could help your “niggles”. LOL @ Now I’m off to find out just what is a “niggle”. I just love these terms you share with us. When we talked Sunday, I thought this was only going to FB. I am so glad that you decided to share it here. I just wanted to say that I agree with your point about the shroud. I attended a guest lecture on it when I was in college. I know that the authenticity has been questioned but one thing is for sure, if someone faked it, they went to a whole lot of trouble to do so. LOL! I also love your point about our bed having been a bed and not a “cooling” slab. Whew! I once visited a slave plantation and during the tour of the ‘Big house’ the tour guide pointed to a back door that was unusually wide. He said, they purposely made it that way so that when Massa’s “time” came the “pallbearers” could easily carry him and his coffin out that door. What a sobering thing to have to look at everyday. Yes dear cousin! I’ll be sharing SOME of my ELSM posts on TTT if I feel that may have a broader interest. I think lots of folks are interested in the Shroud and have opinions about it. Your comments add so much value to the post. Death is quite a sobering thought. If you noticed. I mentioned a couple of theories but didn’t expand upon on Facebook. But here, in a more enlightened atmosphere, I might go into further. For instance, it is most evident that most religions center around death and our fear of it. We develop beliefs, customs and traditions to help allay those fears and doubts. I think it is fear of the ‘unknown’ element of death that drives us toward religion. only we have a conflict of interest! That’s not necessarily a conflict of interest my friend. What leads to to your belief that there is no “God”? You’re welcome and Thanks to you too Sheldon.